You don’t need to go to a water park to see performing seals. You can spot them on websites where they perform the function of conveying information about the purported environmental benefits of products. But do the groups offering those seals – and the companies that display them – have appropriate proof for the claims consumers take from them? If your clients use environmental seals or certifications, you’ll want to see the latest from the FTC staff. Revised in 2012, the FTC's Green Guides discuss the use of certifications and seals of approval. FTC staff just sent warning letters to five groups that offer environmental certifications and 32 businesses that display them. You'll want to review the letters for important details and citations, but here are some key principles to keep in mind. Companies can take steps to reduce the risk of deception. If consumers are likely to interpret general certifications and seals broadly, what can marketers do to clarify their claims? 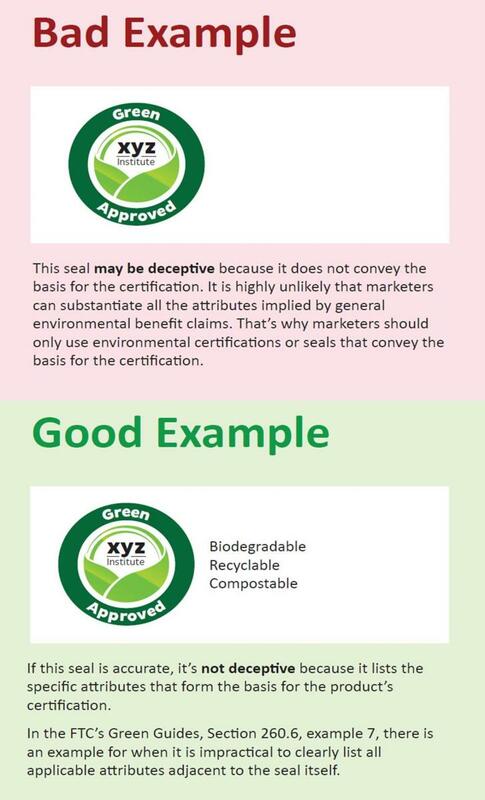 The Green Guides suggest accompanying the visual with “clear and prominent qualifying language that clearly conveys that the certification or seal refers only to specific and limited benefits.” In addition to hypotheticals discussed in the Guides, the second example on the right shows how that might be done. There, the “Green Approved” seal includes the words "Biodegradable, Recyclable, Compostable" – giving specificity to the company’s claims. Of course, the company would still need appropriate proof to support those representations, but listing the specific attributes that form the basis of the product’s certification may reduce the risk of deception. Logos themselves aren’t likely to be effective hyperlinks. Suppose advertisers wants to provide more information to put the certification or seal in context for consumers. They shouldn’t assume people will simply click on an icon for an explanation. Because consumers may view the visual as just another graphic on the page, “a symbol or icon might not provide sufficient clues about why a claim is qualified or the nature of the disclosure.” What’s the best way to convey explanatory information? Make it big. Make it easy to understand. Make it close to the claim it qualifies. As the warning letters indicate, that’s straight from the FTC’s staff guidance publication, .com Disclosures: How to Make Effective Disclosures in Digital Advertising. But in limited circumstances where not all applicable attributes can listed right next to the seal, a clear and prominent hyperlink may help – but be sure to give sufficient information upfront and explain why it’s important to click on the link. The Green Guides cover this narrow situation in Example 7 of Section 260.6 and .com Disclosures offers guidance, too. Both the certifier and the advertiser have responsibilities under Section 5 of the FTC Act. Why did the FTC staff send letters to certifiers and to marketers that display their seals? Because both groups have responsibilities for avoiding misleading claims. For example, as the letter to certifiers notes, “Although your website provides information to marketers regarding your logo’s use, it does not appear to instruct marketers to use qualifying language.” If your clients issue seals or display them, is it time for a compliance check? The FTC has resources for companies that want to keep green claims clean. Filled with real-world examples, the Green Guides were written with busy executives in mind. If you haven’t read them in a while, a refresher may be in order. Interested in a deeper dive? As the warning letters remind companies, the Green Guides’ Statement of Basis and Purpose includes detailed information. Bookmark the Business Center’s Environmental Marketing page for free multimedia resources. THE LANGUAGE IS VERY EASY TO UNDRERSTAND. The FTC is right to actively pursue misleading and false claims by companies green washing their products or services. The prevalence of green washing (NYT, October 18, 2015) confuses the consumer and creates public mistrust for the entire industry. The FTC reference to the generic term Green Seal shouldn't be confused with the credible, widely respected Green Seal certification mark™ of the nonprofit organization Green Seal-- the trusted name in science-based, independent [audits? reviews?] and certification for more than a quarter century. The environmental and health benefits are clearly summarized for each standard. Thanks for your comment, Joanne. The staff letters used the made-up example of “Green Approved.” It was meant strictly as a hypothetical, not a reference to any particular certification program. I recently heard of a new eco-label that is available to day care providers. I understand that providers may apply, pay a fee, then use the endorsement and the eco-label for up to two years before an onsite inspection takes place. Does the FTC address this practice by eco-labelers? The FTC's Green Guides discuss the use of certifications and seals of approval.